The sun is shining and it can only mean one thing – it’s time to get the roof down! And what could be better than feeling cool with the wind in your hair as you cruise the streets. It’s the best type of air conditioning there is! 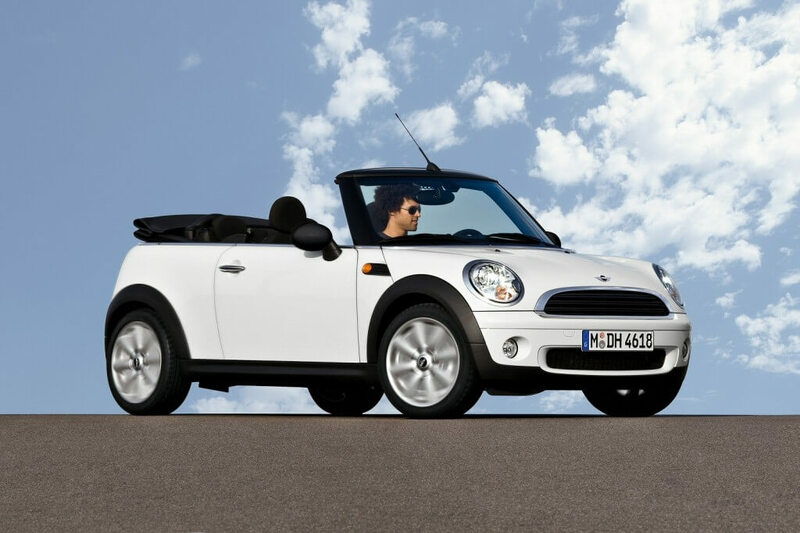 A great drive – the Mini Cooper Convertible is one of the most popular premium hot hatches around! Today’s convertibles are more popular now than they have ever been – faster, flashier and most importantly – more affordable. Unfortunately we can’t afford even the “budget” supercar convertibles that Top Gear used to cruised around the empty roads of Spain in the latest episode (the Audi R8, Ferrari 458 Italia, McLaren 12C are just a little too rich for our tastes), but, there’s nothing like a great convertible to take every day driving to a whole new level of enjoyment. So we’ve compiled a list of our favourites. Check it out and then fire up the engine. It’s a beautiful day outside for a road trip. This dinky six-speed automatic two-door super-mini is compact enough to fit in almost any parking space and with the roof down it gives drivers a grand view of the blue sky. It features four-wheel ABS, first and second row airbags, driveline traction control and low CO2 emissions. Like all MINIs, this stylish Convertible is great to drive, while inside it feels like a BMW thanks to the extensive use of upmarket materials and a great driving position. All engines are relatively economical, but the Cooper S is our range pick thanks to its punchy performance and fun handling. The Volkswagen Golf Cabriolet is a proper four-seat drop-top. Based on the new Golf, the convertible has a well-built cabin, is enjoyable to drive, cheap to run and has low CO2 emissions. The Cabriolet’s body flexes more than the hatchback’s, but it’s still a fun and desirable convertible. The Mercedes E-Class Cabriolet has room for four people and is an excellent cruiser. It offers a fine range of engines and sportier looks while the ride is good. The boot is an awkward shape, but a decent size. Air-cap is Mercedes’ windscreen-mounted wind deflector system, which works brilliantly, though it does impact on the car’s looks slightly. Hot to Hatch – What’s The Best Premium Hatchback?